Standard USB 3.0 flash drives are fast. Flash Voyager GT USB 3.0 is even faster, with data transfer rates of up to two times the speed of standard USB 3.0 drives, and up to eight times the speed of USB 2.0 drives. 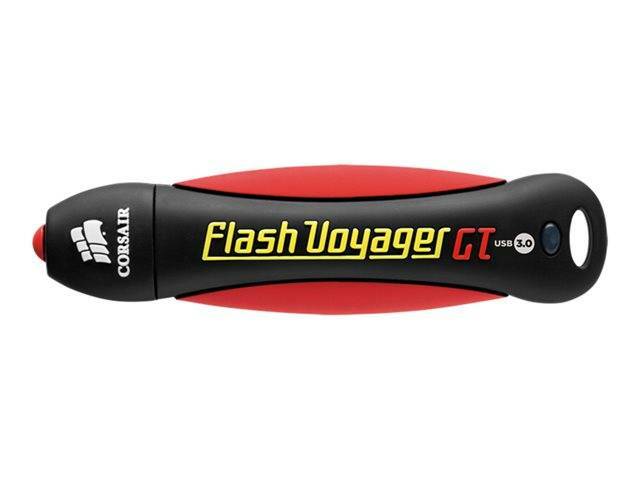 The portability and convenience of USB drives has always meant putting up with delays while waiting for files to copy, but now they're a thing of the past.The finger-friendly ergonomics of the Flash Voyager GT USB 3.0 will make you want to take it with you everywhere, so reliability is essential. Corsair's proprietary all-rubber housing is extremely durable, for worry-free transport of your valuable data. And because accidents happen, Flash Voyager GT USB 3.0 is water-resistant. Unlike traditional storage media, flash drives are solid-state, so they can easily handle the everyday - and not so everyday - drops and bumps that come with the territory. Standard USB 3.0 flash drives are fast. Flash Voyager GT USB 3.0 is even faster, with data transfer rates of up to two times the speed of standard USB 3.0 drives, and up to eight times the speed of USB 2.0 drives. Chances are that you're still using at least one PC that hasn't yet been upgraded to USB 3.0. Flash Voyager GT has you covered: not only is it fully compatible with USB 2.0, it's also one fast USB 2.0 flash drive on the market. Data transfer across multiple PCs is both fast and worry-free. The finger-friendly ergonomics of the Flash Voyager GT USB 3.0 will make you want to take it with you everywhere, so reliability is essential. Corsair's proprietary all-rubber housing is extremely durable, for worry-free transport of your valuable data. And because accidents happen, Flash Voyager GT USB 3.0 is water-resistant. There's no software to install - just plug it in, and go. If your computer has a USB 2.0 or USB 3.0 connector, you can use Flash Voyager GT USB 3.0.